A new Southern restaurant celebrating American soul food has opened its doors in the neighborhood. Called Barbara Jean, the new arrival is located at 4114 Sepulveda Blvd., Suite E in Culver City. According to its website, the spot comes courtesy of notable executive chef Jason Fullilove, whose resume includes appearances on the Food Network, CBS and Esquire Network, along with honorable mentions in a variety of publications. He opened his first Barbara Jean restaurant on Melrose last year, reports Eater Los Angeles. With a focus on the roots of African-American cooking, menu offerings include starters like hush puppies with truffle butter, and deviled crab with avocado and black truffle caviar. Brunch and bar bites are on offer as well, along with decadent desserts like apple crumble with dulce de leche and coconut sorbet. With a four-star rating out of 25 reviews on Yelp so far, the newcomer is getting solid feedback from clientele. John K., who was among the first Yelpers to review the restaurant on June 28, wrote, "We stumbled in on the verge of the dinner menu and immediately fell in love. Tom was so personable and helpful. The shrimp and grits are amazing and the Brussels sprouts, although a little oily, were delicious with caramelized apples and garlic." 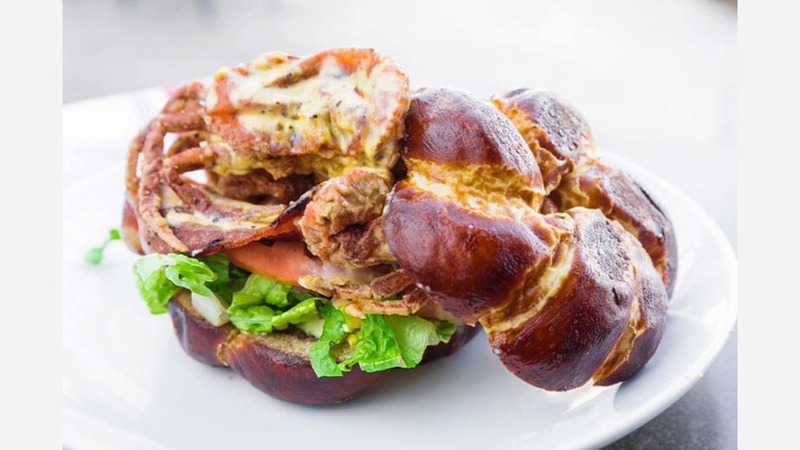 "The food is ridiculously delicious," added Yelper Luis C. "The soft-shell BLT is definitely a banger! So in love with everything about it, from the pretzel bun to the housemade pickle!" Interested? Stop by to welcome the new business to the neighborhood. Barbara Jean is open from 10 a.m.-9 p.m. daily.